♦How much can I borrow? For our regular Personal Loan, you may get as much as 3 times of your gross monthly income, with amounts ranging from P20,000 up to P2,000,000. For our Seafarer Loan, you can get as much as P300,000, subject to our approval. ♦How long will it take to process my loan application? A personal loan application is processed within 5-7 working days upon receipt of complete documents. ♦I already signed my loan documents. When will the loan proceeds be credited to my account? The proceeds will be credited to your account within 1-2 banking days from the date of signing. ♦Are there other fees and charges? Once you book the loan, a minimal one-time processing fee of P1,500 will be deducted from your loan proceeds. For loans above P250,000 or for business purposes, government requires a Documentary Stamps Tax equivalent to P1.50 for every P200 of the loan amount. 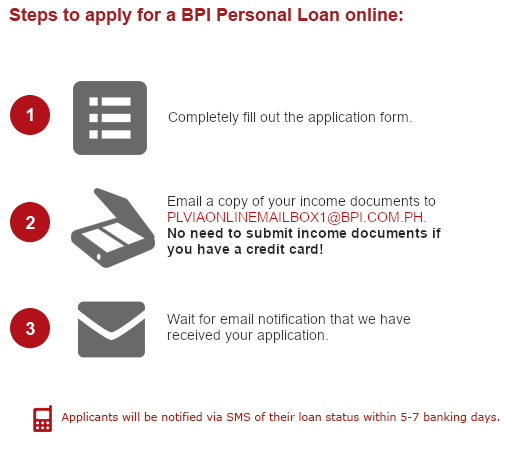 ♦How do I apply for a BPI Personal Loan? Apply at your convenience through this link or through your nearest branch. For the list of BPI Branches, click here. For other inquiries, you may call 89-100 or email us at bpiexpressonline@bpi.com.ph. Please also make sure to submit your application form together with the complete requirements. Click here for the list of required documents. ♦ don’t have a BPI account. Can I still apply for a personal loan? We can still process your loan application. Once your application is queued for approval, we will be requesting you to open an account with us. Your loan proceeds will be credited to your BPI account. Your monthly installment will also be automatically debited from this account. ♦My monthly income does not meet your minimum requirement. Can I still proceed with my application? All personal loan applications are subject to credit evaluation and approval based on these requirements. Take our Loan Readiness Test to know if you are ready for a Personal Loan. ♦How do I pay for my monthly installments? Conveniently pay your monthly installments via automatic debit (ADA) from your BPI deposit account. The ADA will run monthly on your scheduled due date. ♦When will be the due date of my monthly installment? Can I select a due date? Your monthly due date will be equivalent to the date when your loan is booked. For regular personal loan, the first installment shall start 30 days after your loan booking date. For our seafarer loan, the due date will start 60 days after the loan is booked because the first monthly installment is deducted from the loan proceeds. ♦How much will be my monthly installment? Your monthly installment will depend on your chosen amount and term. Check out our Loan Calculator page to get an estimate of your monthly installment. ♦How do I monitor the status of my loan application? Updates on your loan application shall be sent thru SMS to the mobile number you have provided in your application. You may also call 89-100 to ask for updates. ♦Can I view my personal loan details via bpiexpressonline.com? If you already have an existing bpiexpressonline account, your personal loan account will automatically reflect in your Portfolio page. In case you can't view it, or if you don’t have a bpiexpressonline account, please call 89-100 for assistance. ♦I am a natural born Filipino but has acquired different citizenship. Can I apply for a Personal Loan? You may continue to apply provided your are currently residing in the Philippines. Aside from the regular requirements, you will be asked to present a valid government-issued Alien Certificate Registration (ACR) ID. Your application will be subject to credit evaluation. ♦I am a foreigner married to a Filipino. Can I apply? BPI Personal Loan is currently available to Filipino citizens only who are residing in the Philippines. ♦I am an OFW and currently abroad. Can I apply? You can submit a Personal Loan application while you are abroad thru bpiexpressonline. However, once the loan is approved, we require clients to be physically present to sign the loan documents in any BPI branch in the Philippines. ♦My personal loan application has been approved but I am currently abroad. How can I proceed with my loan availment? Customers are required to sign the loan documents in any BPI branch in the Philippines. The approval of your loan shall only be valid for one month from the date of approval. ♦Can I pay over-the-counter or via online for my monthly installment? Payment for your monthly installment is done via ADA (Automatic Debit Arrangement). Since your account is enrolled to ADA, you just have to make sure to sufficiently fund your nominated BPI account in time for your monthly due date. ♦I want to pay off my loan. How do I proceed? Early loan pay-off can be done through a BPI branch. To know your pay-off amount, please check your Personal Loan Account Portfolio via bpiexpressonline.com or call 89-100. The interest of your loan is computed daily so your pay-off amount is valid for the same day only. ♦I just paid off my loan but I still got a payment reminder SMS. Does it mean that my account is not yet closed? Our SMS notifications are system generated based on your original due date schedule. If you have already paid off your loan, please disregard the payment reminder . Should the reminders persist beyond your next due date, please report to our hotline (02) 89-100. ♦My deposit account is not sufficiently funded . What happens if I fail to pay my monthly installment? Your unpaid amount will be charged a late payment penalty fee of 5%. For example, if you missed paying your monthly installment of P1,000, you will be charged a late payment penalty of P50. ♦Can I request for documents on my loan payment history? Yes. Please call 89-100 for more details. ♦My personal loan account already reached its maturity. Can I request for certificate of completion / full payment? How? You may request for a Certificate of Full Payment at your nearest BPI branch or call 89-100. ♦I can no longer view my personal loan account details in bpiexpressonline. What should I do? Bpiexpressonline requires accounts to be in updated (not past due) status in order for account details to be viewable. Kindly call 89-100 for assistance on how to settle your past due balance. ♦I have an existing personal loan. Can I apply for a 2nd account? We highly recommended for existing personal loan account holders to apply when they have already paid at least half of their outstanding personal loan. ♦My personal loan is maturing / fully paid off. Can I renew my personal loan account? Do I still need to submit new documents? There is no auto-renewal for a personal loan. You may reapply for a new account and submission of updated income documents is required. Your loan application shall also be subject to regular Credit evaluation. ♦How do I change my account information (ie. Address / Contact Info / Due Date / ADA account / Account Name, etc.)? You may request for account information update at your nearest BPI branch or call 89-100.